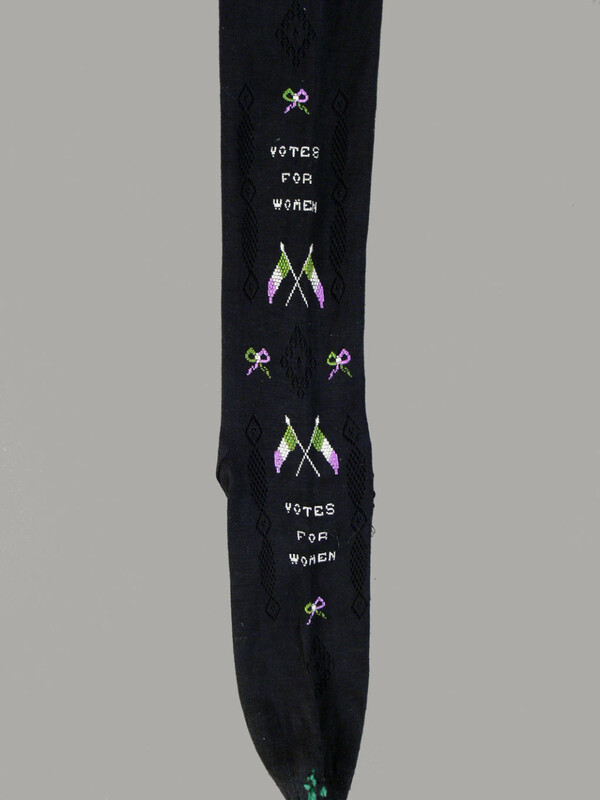 Recently the museum added to its collection of suffragette items a very personal piece of clothing; a pair of black stockings embroidered with the suffragette slogan ‘Votes for Women’. Belonging to Yorkshire suffragette Elizabeth Wright, the stockings would have been worn at the start of the twentieth century at the height of the marches and demonstrations by English women to obtain the vote. Suffragettes were women who had turned to violence and disruption in order to gain publicity, frequently being sent to prison for their actions. Many of them belonged to the Women’s Social and Political Union, which produced a large range of merchandise, sold in its own shops, to advertise the cause. Stockings like this pair were purchased and worn by thousands of women when they attended marches and rallies. Little is known about Elizabeth Wright herself, however she was among a large number of British women who turned from passive protest to active militancy during the early 1900s in order to try and gain the vote. That she wore the stockings frequently is clear from the amount of darning evident in the toes. The positioning of the embroidery on the lower part of the stockings indicates the rise in hemlines that often accompanied women activists’ ambitions and their desire for more physical freedom. It also drew attention to the feet of the wearer. It has been argued that the high-heeled shoes worn by many suffragists were designed to reassure others of their wearer’s femininity, despite their progressive views. Others have argued that the heel itself was a political statement, bringing women up to equal height with men. This pair of stockings joins a small but important collection of suffragette items now held by the museum. Other objects include the board game Pank-a-Squith, a suffrage pendant, a souvenir serviette from a suffrage march, and a hunger strike medal. Another important part of this collection is a pamphlet that highlights the gains made by women in New Zealand and Australia, having obtained the vote in the late 1890s, and using them as models to aim for in the British struggle. Several of these items are currently on display in the museum’s From Our Collection display and they are well worth a visit.